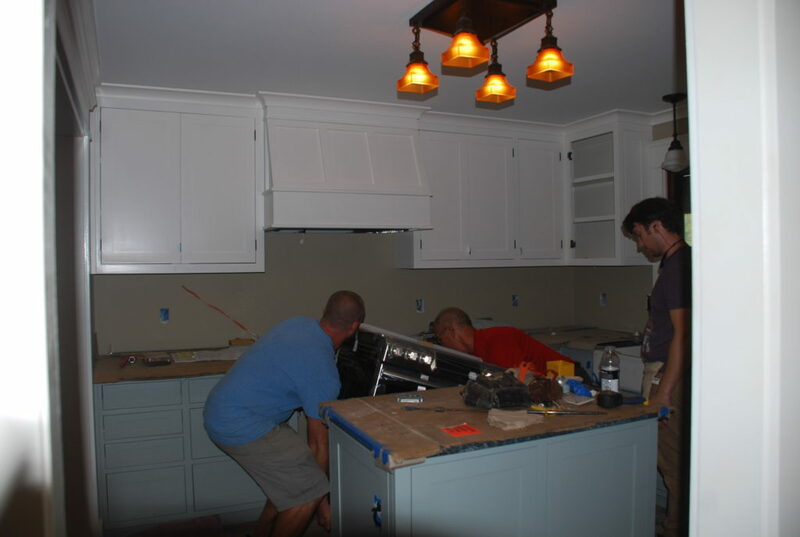 Viktor and his crew was back this week to do a little more on the interior trim and built-ins. 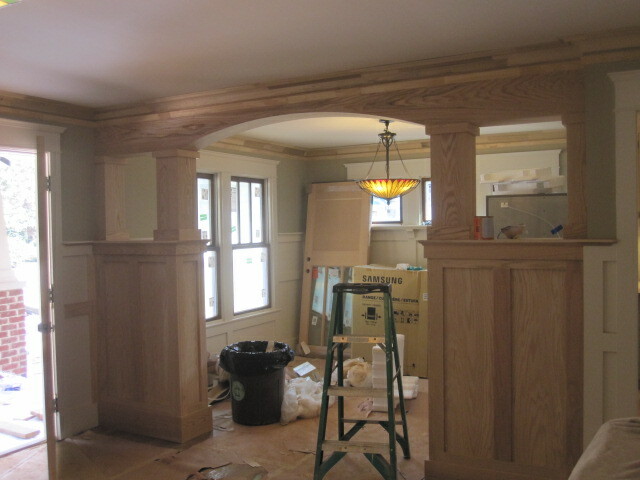 The colonnade and the rest of the Family and Dining Room walls were trimmed out. 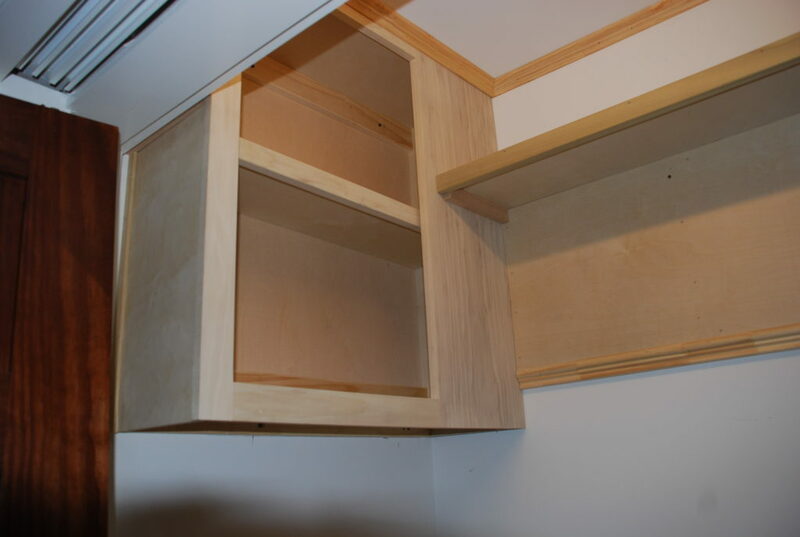 And then the wall cabinets and shelf for the Laundry Room were installed and ready for paint. 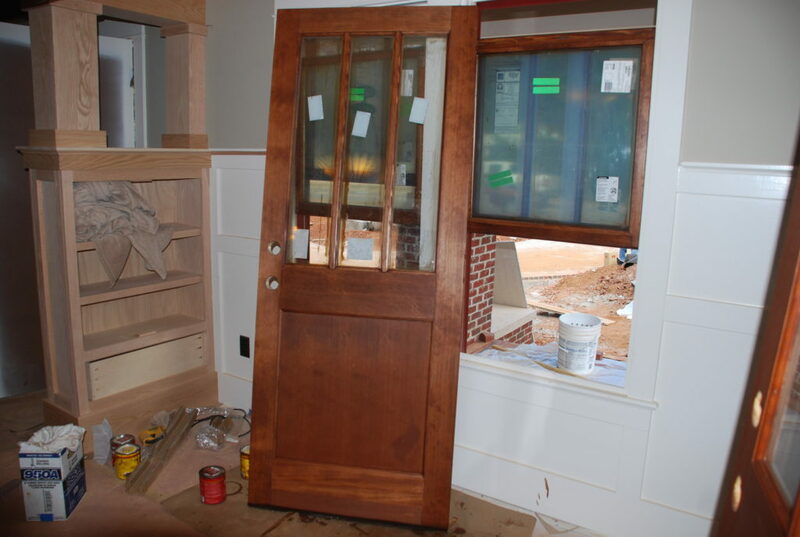 The painter was also busy – not just with the walls, but also working on the interior doors, as well as the front door (above). 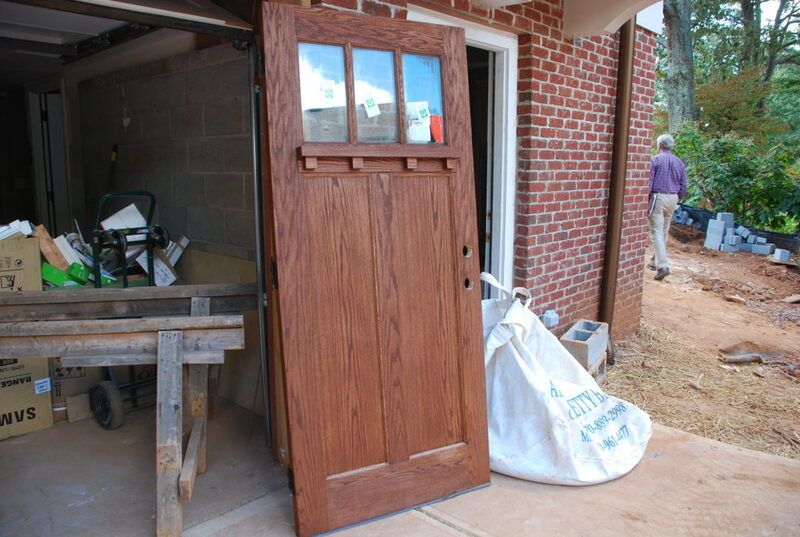 Here is one of the back doors stained and ready to re-hang in its frame. 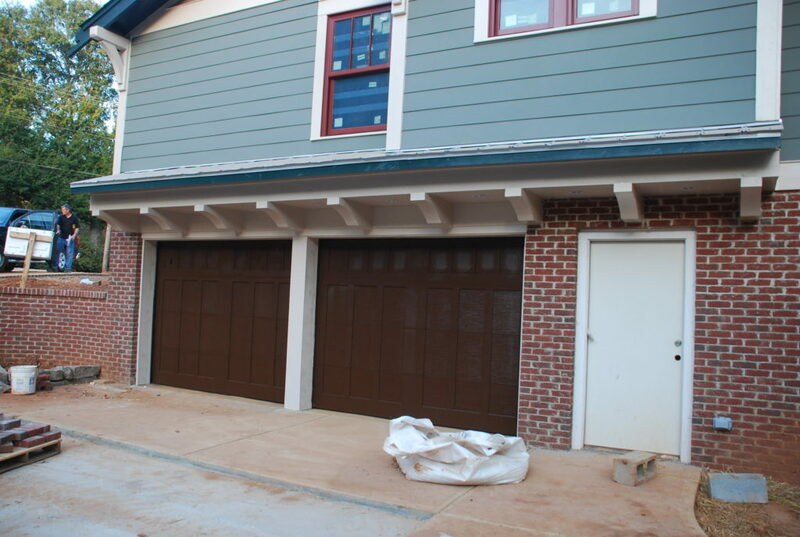 Around the side, we’ve picked a nice brown to paint the garage doors and the people door into the Garden Room. They’re a little shiny so I think we’ll use a satin finish for the second coat. 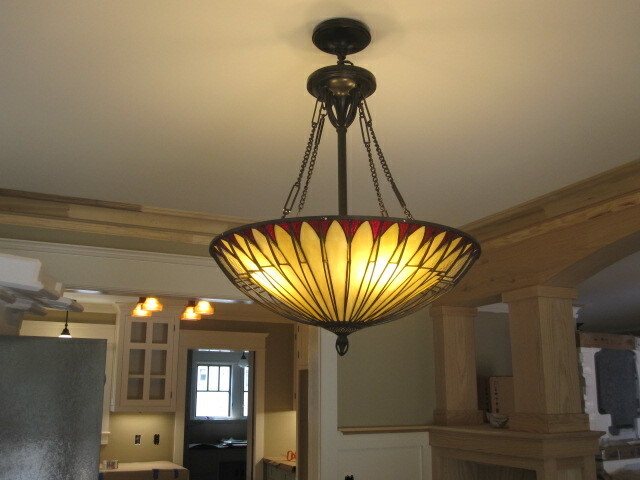 One of our favorite light fixtures is this one in the Dining Room. It looked nice enough in the box, but when the lights go on the colors really pop. The plumber was also back to put in some fixtures and fittings. In this photo of Bath #2 the toilet is in place and the shower fittings are all ready to go. We selected a nice chrome vintage-looking faucet set for the Kitchen sink and had the countertop folks drill holes for it. 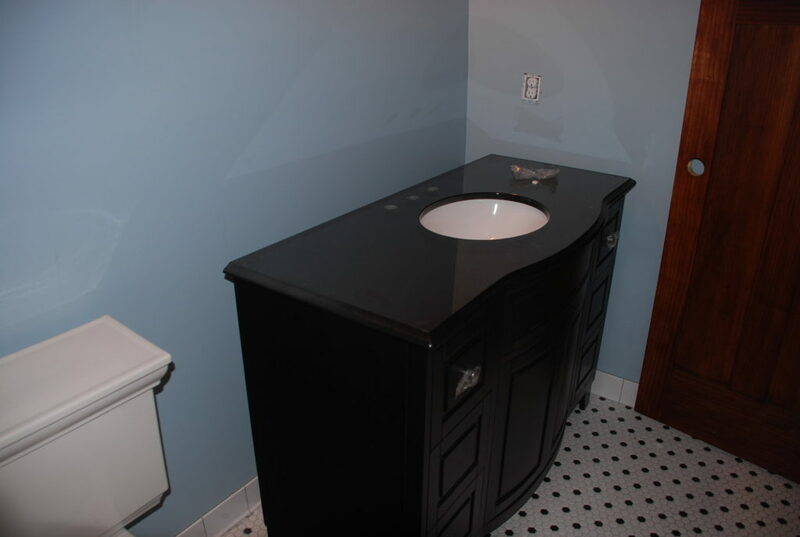 There’s also a built-in soap dispenser on the left and an air switch on the right for the disposal. Upstairs we bought two identical vanity cabinets and have had them in storage for several months. While Joshua was here we toted them to the house and now they are sitting in the bathrooms and ready for the plumber to hook them up. 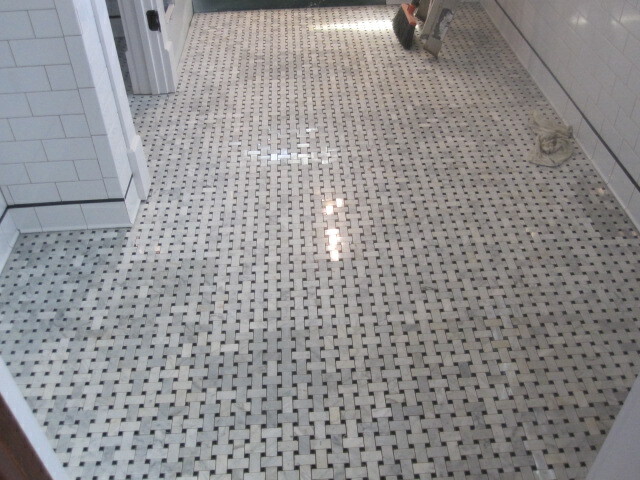 Our tile contractor has also been busy – first they finished up the basketweave marble tile floor in the Master Bath . 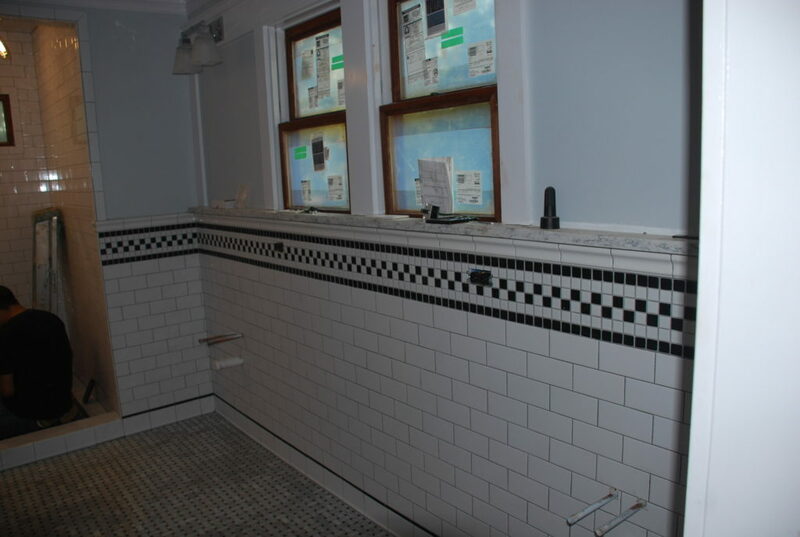 . . and then they built up from there with the subway tile and mosaic band detail on the walls. 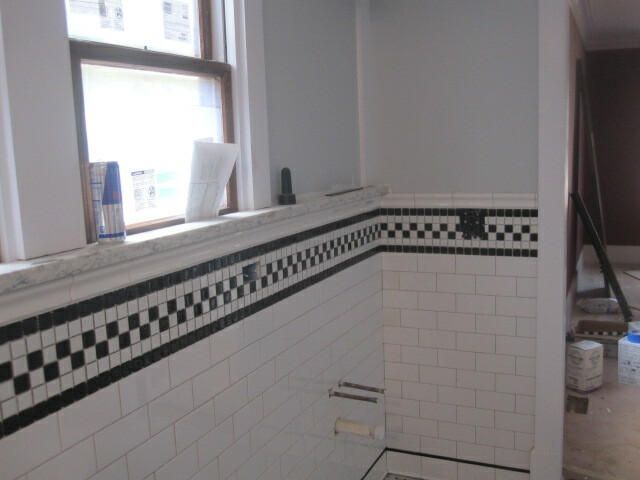 Here’s a view of the Master Bath exterior wall with the tile work completed. 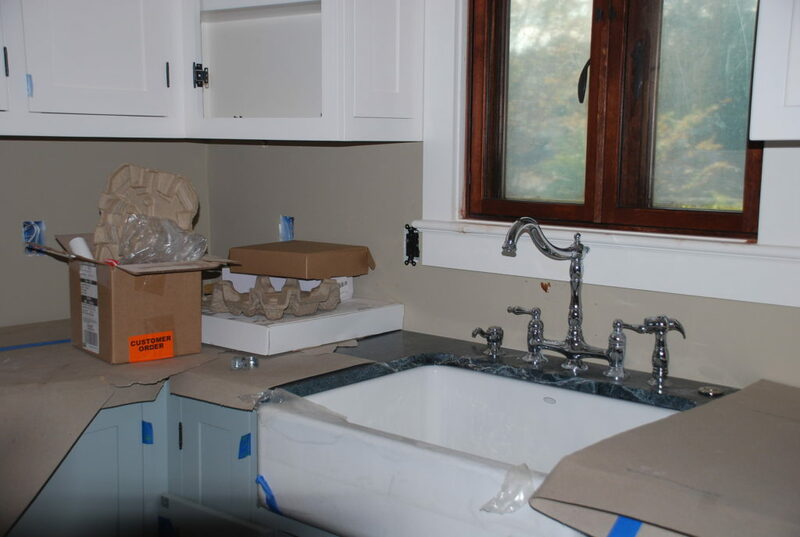 Before long we’ll have two pedestal sinks and a cabinet below the window. 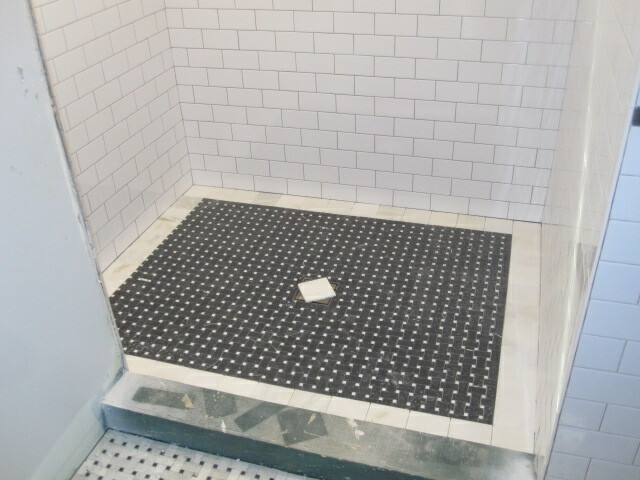 For the Master shower we found a marble baskeweave tile that is the opposite coloration of the main tile in the room. 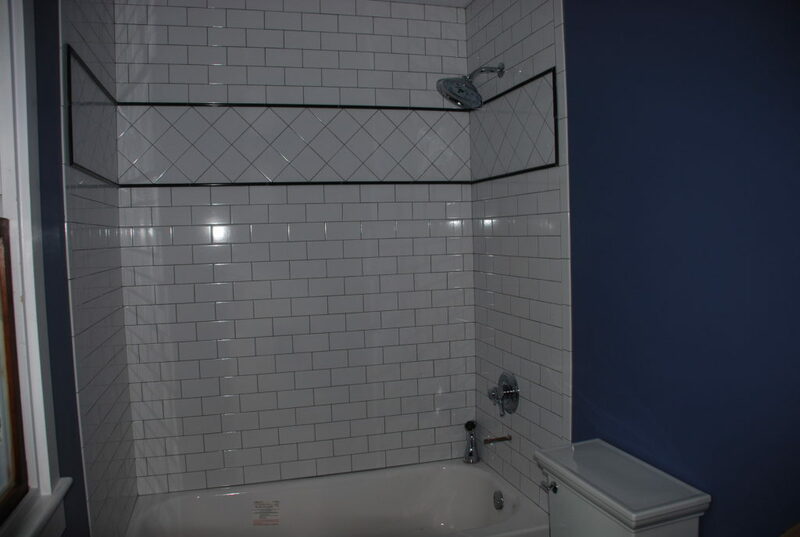 It is surrounded by 4″ square marble tiles. The drain isn’t done yet – watch for an update on it soon. The appliances have been waiting in the Dining Room to be installed and the Gernatts finally decided that it was time to get them in. Here are Andrew and Tom hefting the range into place. The Kitchen is fairly small and we didn’t want to put a microwave over the range, so we found this very cool ‘Drawer Microwave’ made by Sharp. 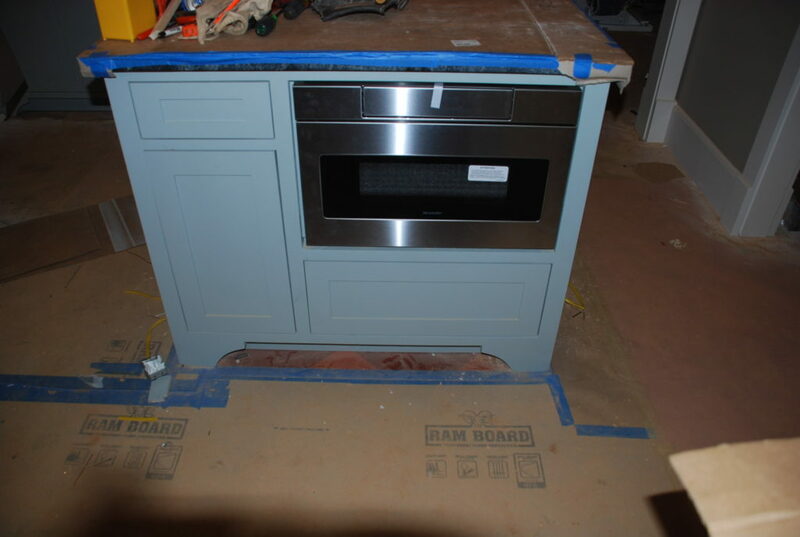 The center panel in the middle folds out to expose the digital controls and the oven opens just like a drawer. 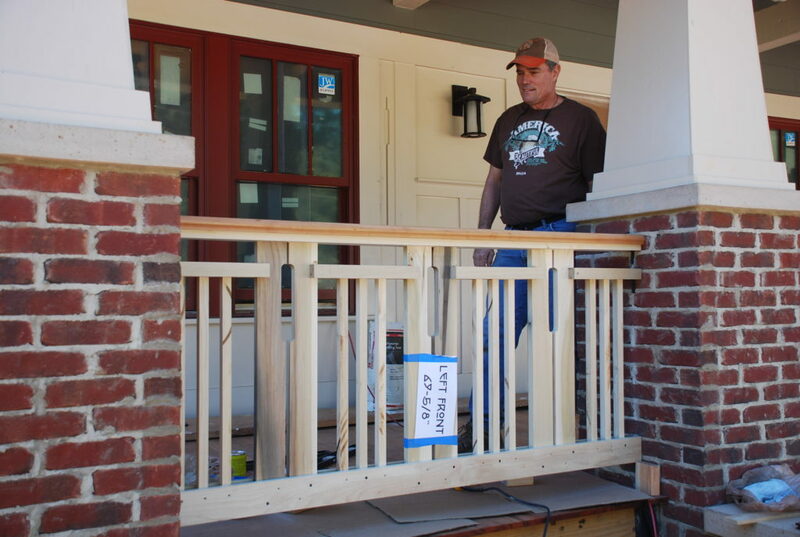 Meanwhile Dave has completed building the railings for the Front Porch and we met on site with Andrew and Clint to go over the process for installing them. It’s a little complicated with three brackets on each side and the railings have to be cut precisely to fit between the brick piers. 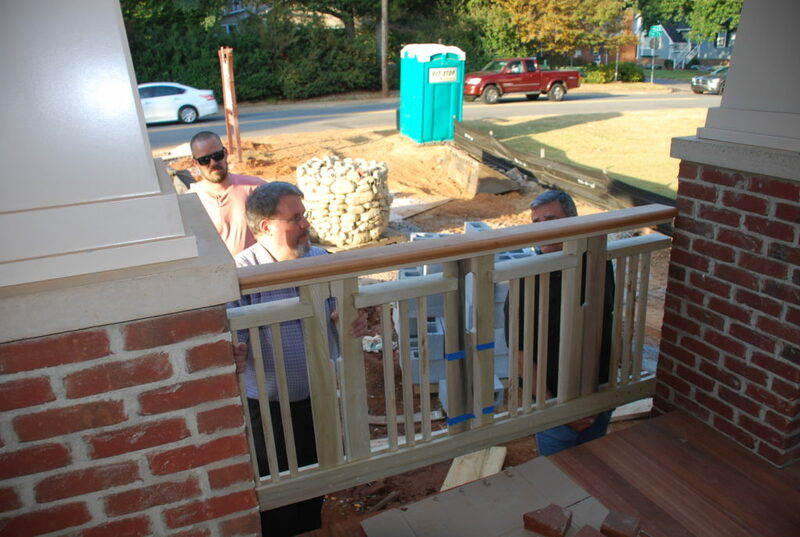 Here Clint has the first one cut and test-fit between the piers. Once they are all cut, then they have to be primed and painted before they can be installed. 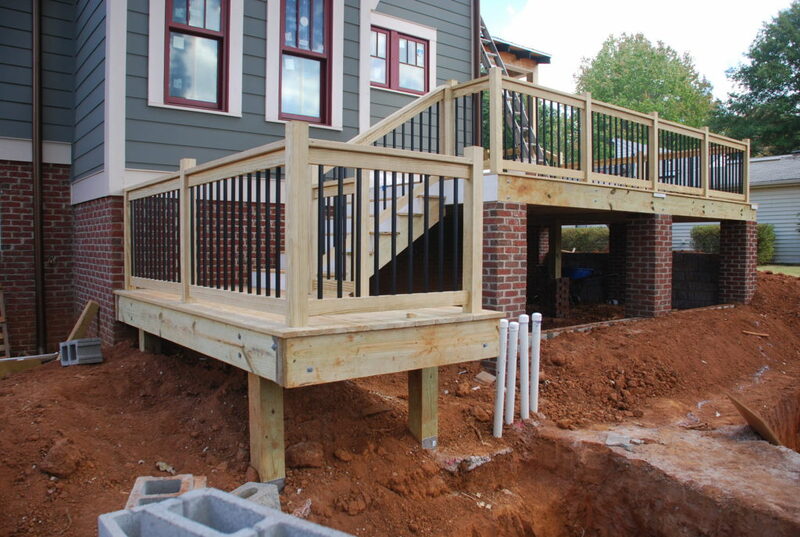 Around back the Deck contractor was back and got the supports and the railing posts into place. 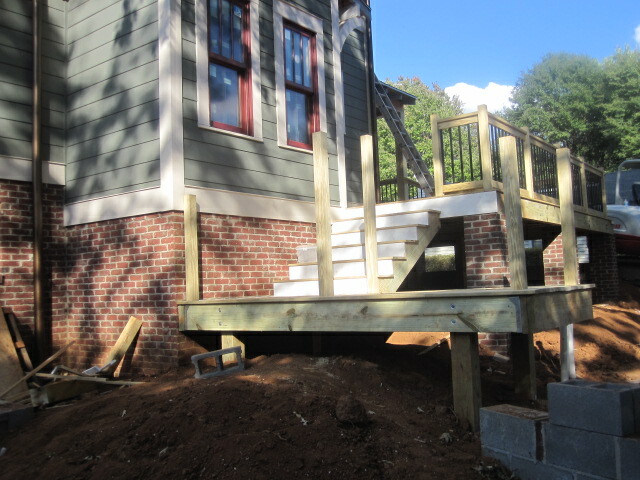 Then it was time to add the railings to match the ones on the deck. We actually will have a few more steps down, but before we can construct them, the pond folks will have to do some more plumbing work to get those 4 PVC pipes down into the ground. 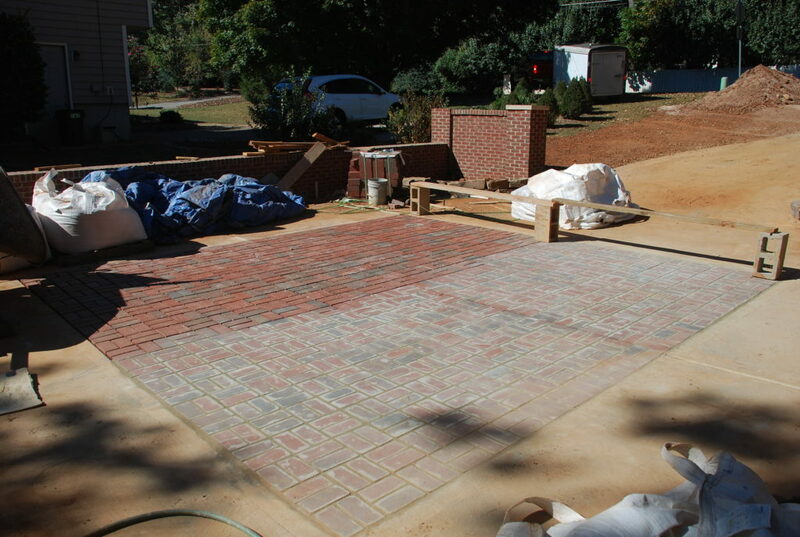 Last week we added a concrete pad at the big square cut-out in the driveway outside the Garage doors. 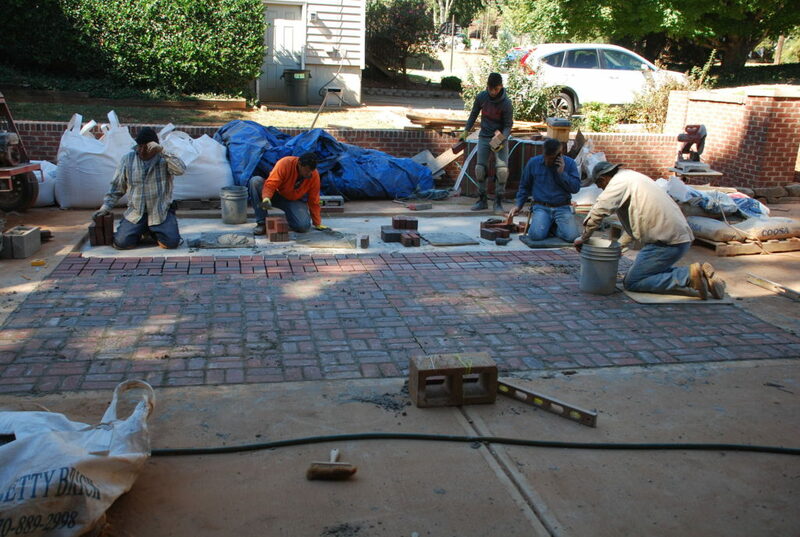 Now that the concrete is set, the masons were back to lay the brick pavers. Here you can see them all laid, and the ones in the foreground are mortared in. Once they are all mortared and cured we will brush them down with muriatic acid to get them all cleaned up. 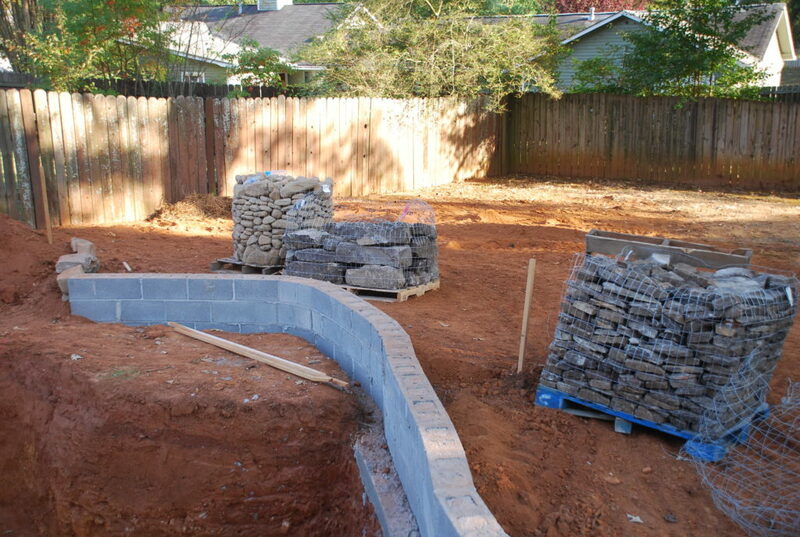 We’ve also planned for a sunken patio in the back yard and the masons poured a footing for the retaining wall this week. Next they will add the block that you see stacked off to the side to create short walls that will then be faced with stone. 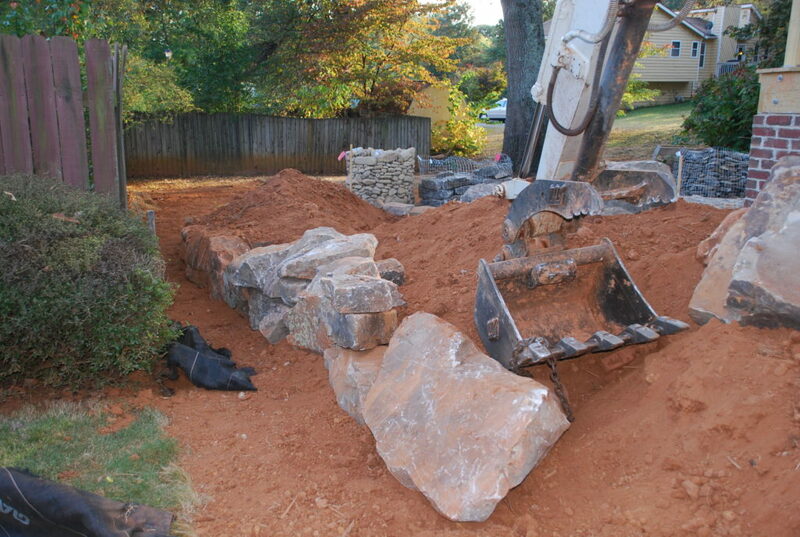 It is almost time to start applying stone veneer to the pond wall. 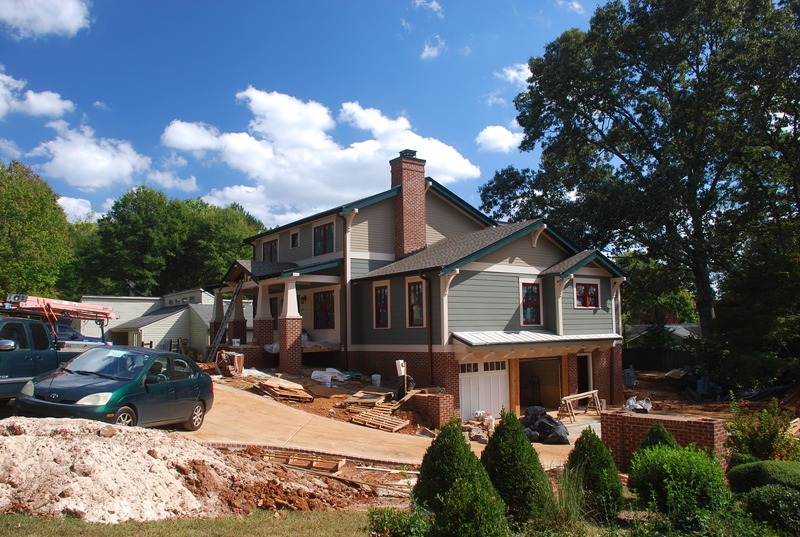 As soon as the liner is in, then the stone work can begin. 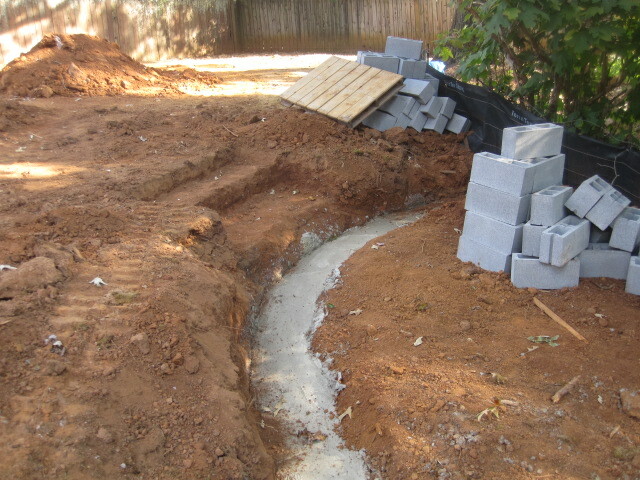 The boulders that you saw last week have been moved around by the back deck to elevate the area and create the stream that will feed the waterfall. Here are more boulders looking from the other side. The waterfall will be just to the right of them. Looks like next week is going to be mostly outside work. Seems it is getting increasingly difficult to get subs scheduled. We’re hoping that we can get in before Thanksgiving, but it is going to be close. 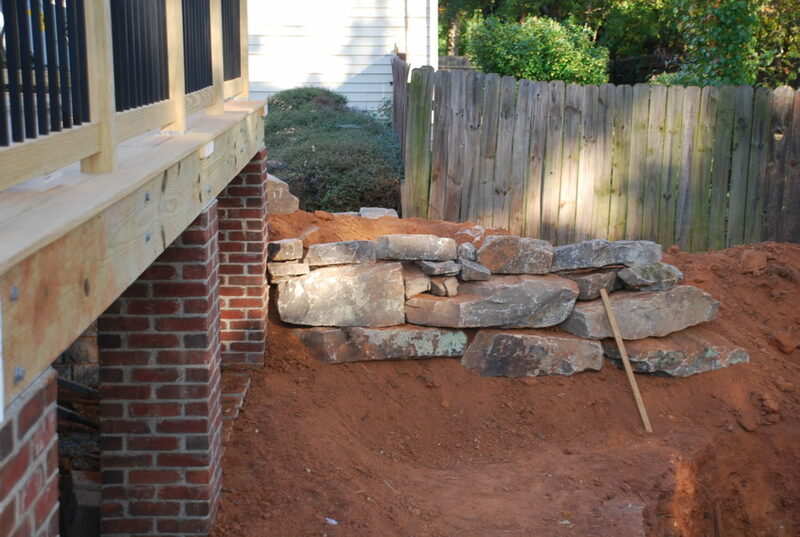 Next October – Week 4 – Outside work this week – railings, patio, stream/waterfall, pavers & stone, and finally some plants!